Angelo Rules - The game - had something to draw for school today but he completely forgot to do it! Help him to get out of this mess by finding out a brilliant plan! You are not alone, Lola and Victor are there to help. Find the tools needed, explore the house, set a trap for Alvina ... and thanks to you Angelo will be alright. ☼ AN ADVENTURE BASED ON THE HIT TV SHOW ANGELO RULES! 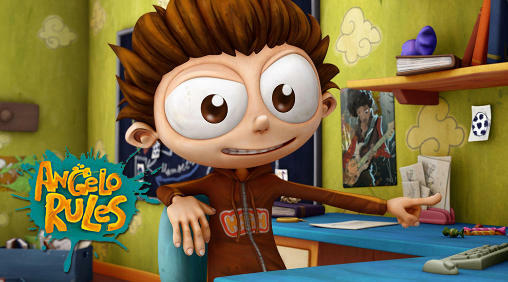 A new exciting adventure with the 3D characters as on TV. ☼ SEVERAL PLANS TO SUCCESSFULLY COMPLETE YOUR MISSION: if one does not work, no problems, Angelo has lots of crazy ideas in store! ☼ THIS FIRST EPISODE IS FREE! The game is made of several episodes. And the first is available for free. The game will warn you when a new episode is available! ★ The game is developed by the producer of the TV show. ★ All the games are suitable for children from 5 to 12 years.